The seedling/leaves/stem/whateveryoucallit is from a pineapple which she and her family grows in their weekend farm in Cavite. Composting soil was used for this, and so there are other greens/weed-like growths beside the pineapple. Nainggit yung isang officemate, si Sir Rico, kaya nagtanim din siya ng sarili niyang pineapple. His pineapple's growth is stunted though (bonsai pineapple!) kasi the 'pot' he's using is really shallow. Kawawa naman yung roots, hindi maka-stretch. Will update you on the pineapples' progress in the following weeks. Stay tuned! 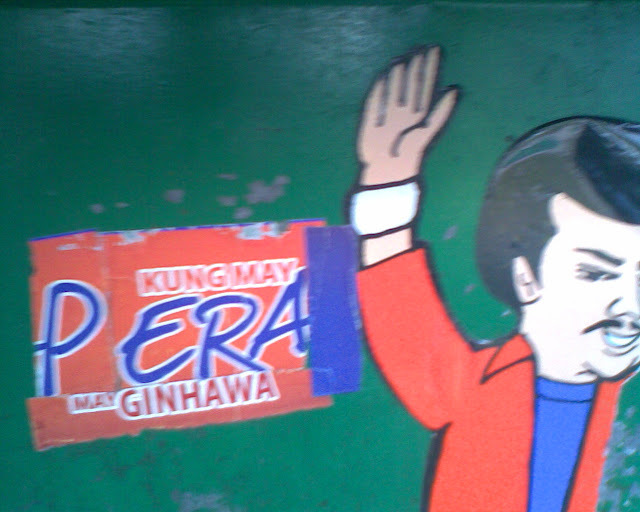 Seen in a tricycle. By transposing just 1 letter, the ingenious tricycle drivers were able to make a catch-phrase which made made more sense. I found this moisturizer sachet and tried it. My regular brand is Myra E's facial moisturizer (because it's the cheapest! :D); I found this Seaweed Day Cream of Body Shop good, it felt better than Myra E's. I wonder how much it retails for though. Japanese junkfood! From one of the bosses in the office - pasalubong galing Japan. I liked the bits which were wrapped in nori. Cute! They all tasted the same naman, parang rice crackers. Healthy living! Papaya for dessert. :) Everyday diet is normally protein and carbohydrates (rice + pork/beef/chicken ulam), so the vitamins, minerals, and fiber from papaya were a welcome addition to my system.